The Fire Coral is also known as a "stinging coral" because if touched it will produce a burning or stinging sensation! The Fire Coral Millepora alcicornis belongs to the class Hydrozoa, and are known as hydrocorals. This species is just one of the many members in the Millepora genus. This genus contains the common "fire coral" or "stinging coral" species that have a potent sting, causing a burning sensation if touched. Usually it is just a mild sting, but for some people the reaction can be all the way up to anaphylactic shock. Divers, snorkelers, and aquarists need to wear gloves when handling these corals or are anywhere near them. Fire Corals could be described as very hardy “soft” corals. They have a similar appearance to stony corals, and are found in similar habitats. But the Millepora genus are not considered stony corals due to their internal structure. Like the stony corals, they do produce a hard aragonite skeleton and aid in reef building, yet inside their structure are canals that house all of their polyps and aid in food distribution. This makes them no where near as dense and hard as a stony coral. The Millepora genus can take many forms including arborescent (treelike), plate-like, encrusting, lace-like, box-like or columnar. These different forms develop in conjunction with the water flow where they are found. Encrusting colonies are the initial growth form of these hydrocorals. In areas of strong water flow they will continue to encrust, but in a low water flow area they will develop into a lacy branching form similar to the Stylaster Lace Corals, but not on a single plane. Their branches can become leaf-like, blade-like, or even box-like in areas where the water flow increases in strength. Thus the common names they are known for besides Fire Coral and Stinging Coral are Branching Fire Coral, Box Coral, Bladed Fire Coral, Finger Coral, Ginger Coral, and Wello Fire Coral. Don’t be dissuaded from keeping Fire Corals because of their sting. They are interesting corals that are hardy and easy to propagate, just be careful and wear gloves. In the wild they are adaptable to many environments, thus contributing to their hardy nature. They let you know their lighting needs by their color, with yellow indicating perfect light and brown being “not enough.” They also need strong water movement or they will not grow as much. The Fire Coral, Millepora alcicornis has earned the name "FIRE" for good reason! It is strong enough to put some people into anaphylactic shock, however most of the time it is a bad sting. The positive thing is that they grow so slow, less than 1" per year, that they can be kept in a nano tank, without the risk of over growing everything so fast. They also will hold their own and other corals will generally stay away from them! Thorny mud crab hanging out with a Fire Coral! The Fire Coral, Millepora alcicornis, while immune to the Crown of Thorns can succumb to predatory polychaetes and nudibranchs from the Phyllidia genus. Many critters like this crab will find safety in it's branches. Hawkfish, who do not have any tissue on their pelvic fins will perch between the branches and will not be stung as they enjoy the protection of the Fire Coral. The Millepora genus was described by Linnaeus in 1758. This is the only genus in the Milleporidae family. There are at least 48 species with a few being M. alcicornis, M. complanata, M. dichotoma, M. exaesa, M. murrayi, M. nitida, M. platyphylla, M. squarrosa, M tenella, and M. tenera. The Millepora genus are found from the Red Sea, south to Madagascar, then east toward Australia's west coast in the Houtman Abrolhos Island area. They are also found from the Great Barrier Reef all the way around Australia's north coast and mid way down the east coast. From New Caledonia they occur all the way to the Tuamotu islands then north to the Hawaiian Islands, circling back to the Southern tip of Japan. Then they are found westward including all of Indonesia and back to the Red Sea. Some are also found in the Atlantic Oceans including the Gulf of Mexico and up to Canada via North America’s east coast. The Fire Coral is on the IUCN Red List for endangered species under least concerned. This is due to population reduction from habitat loss and reef degradation, however they recover quickly. In 10 years, if climate changes and ocean acidification persists, this will change the classification. The Millepora genus is commonly one of the first corals on the scene of a new reef and the last ones to leave when a reef is dying. They cover 10% to 50% of reefs, as well as being a small part of all reef building corals. Some common names these hydrocorals are known for are Bladed Fire Coral, Wello Fire Coral, Fire Coral, Box Coral, Firecoral, Stinging Coral, Finger Coral, Ginger Coral, and Wello Fire Coral. The Millepora genus has been propagated in captivity, yet is not always available. The Millepora corals are found at depths from 0 to 148 feet (45 m) in areas of high current and light. They inhabit reef slopes and projected parts of the reef that have strong wave and current action. These include tidal inlets, sheltered bays, mangrove shores, exposed bay areas and ledges at the entrance of these bays as well as in sounds, shallow reefs and shallow coastal benthic habitats. They are occasionally found on mangrove roots and in the shallow protected areas where there are solid beds. Facing into a strong currents, they can make use of the passing plankton, small floating invertebrates, and other prey. They use the venomous cells (nematocysts) found in their tentacles to catch prey in these nutrient rich waters, but also to sting and deflect any possible threats or attacks. IUCN Red List: LC - Least Concern - They have experienced some habitat loss, however they recover quickly. The Millepora genus grows in many formations, all dependent on water movement. They can form branching, laminar, encrusting and massive colonies. This genus is not considered a stony coral due to its internal structure. They do produce a hard aragonite skeleton, yet inside are canals that house all of the polyps and aid in food distribution. This makes them no where near as dense and hard as a stony coral. The smooth surface is densely dotted with mouths that look like small pores. The colors of the Millepora sp. are usually a mustard yellow to dark brown and cream with white or lighter colored tips, with some rarer species being green or pink. On the smooth surface, the dense populations of pores are called called gastropores and they contain polyps in two sizes. The larger polyps are called gastrozooid polyps. They tend to stay within the corallum, (not extending outward past the surface of the coral), and help to digest food and pass it through the colony within the skeletal structure. The smaller polyps surrounding this gastrozooid polyp are called dactylozooids, and they number between 5 to 7. The dactylozooids look like tiny hairs that stick up beyond the surface, giving these hydrocorals a fuzzy appearance. The dactylozooids polyps have a strong toxin to sting prey. Once stung, these polyps will then bring the food inward to the gastrozooid polyp in the middle, which will engulf the prey and digest it. These corals will burn your skin if you are not careful. They are a bane to divers and it is best to look and not touch in the wild. The Fire Corals Millepora sp. can grow up to 12" (30 cm) in height. Encrusting forms can sense nearby corals and will grow towards them and then encrust over them, using their structure as a base. The Branching Fire Coral is found in several areas that do not have strong wave action, and so are generally the branching form. This coral will typically overgrow and take the shape of any coral it gets near, especially gorgonians. 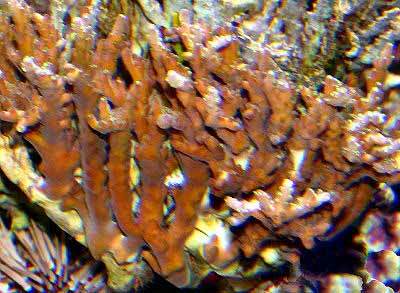 The Box Fire Coral is from the Atlantic and are usually pink to cream with white or lighter colored tips. They tend to grow in a box-like formation from an encrusting base. The Blade Fire Coral is found in the Caribbean and grows in a blade formation. These hydrocorals are found in surge areas with strong waves and generally form heavier leaf-like, fanlike or vertical plate-like structures. Lifespan: 10 years - May live longer. Maturity is reached at 3 to 8 years after a hydroid plants itself. The Fire Corals can be easy to care for as long as lighting and water flow are strong. They will turn brown under inadequate lighting. They adjust themselves to the water flow in your tank as they grow, so once established try not to move them if you can. They will cease to grow very much at it there is weak water movement. Caring for a Millepora coral in the aquarium requires that you be very careful. These hydrocorals have a potent sting. It can just be a mild sting for some, but for others it can be all the way up to anaphylactic shock. Needless to say, wear gloves when you are handling them or are anywhere near the coral. Don’t be dissuaded from keeping them because of their sting, however since they are hardy and easy to propagate. Just be careful and wear gloves. If you experience a sting, applying ammonia and warm water are two suggestions. However keeping powdered meat tenderizer around is a good idea if you own, or will be purchasing one of these corals. Meat tenderizer seems to be a constant as a relief cure. This will alleviate the burn and itch of their sting. These items are a neutralizer for these particular forms of nematocyst stings, but will not necessarily work for jellyfish stings or other types of nematocyst stings. Fire Corals depend on light and photosynthesis for about 75% of their growth, they also do well being fed plankton. These “hungry hydrocorals” will eat live brine shrimp as well, or any defrosted foods like mysis, etc. that get into their “hairy” stingers. Turning the pumps off while they feed is a good idea. Diet Type: Carnivore - 75% of their growth is from light and photosynthesis. Live foods (fishes, shrimps, worms): Some of Diet - Live brine shrimp and/or mysis shrimp. Meaty Food: Some of Diet - Frozen mysis and brine shrimp are acceptable. Stable tank conditions are required to keep the Millepora genus. Although similar to a "soft coral", they do have calcareous skeletons and need parameters similar to hard corals. Do typical water changes of 20% a month, 10% biweekly, or 5% weekly. It has been noted that 5% weekly water changes replenish many of the needed additives. Purigen and Poly-fiber are great products to help in maintaining water quality. Purigen is a synthetic polymer that removes soluble and insoluble impurities from water at an exceptionally high rate and capacity, helping to control ammonia, nitrites and nitrates. Additions of Iodine and and trace elements are suggested. Water Changes: Weekly - Changing 5% of the water weekly is best, or 10% bi-weekly. A 20% monthly water change will work if additives are provided. Alkalinity Levels: 8.0 - 11.0 dKH - 10 dKH is best. A typical reef environment is what is needed for your Fire Coral. This is a great nano tank coral, and it will also do fine in a larger tank due to its slow growing nature. A mature tank (well over a year old) is advised to increase the chance of successfully keeping Millepora. They need strong lighting, though not necessarily Metal Halide. They can be placed in the middle of the tank with T5s, and on the bottom of the tank with Metal Halides and strong LED. These corals prefer a strong water flow that is turbulent and surging, but not linear. Provide an average salinity of 1.026 and normal temperatures. Lighting Needs: High - Strong lighting - T5s are sufficient if the corals are placed in the middle of the tank rather than on the bottom. Water Movement: Strong - Turbulent and/or surging, not linear flow. Water Region: Middle - Middle of the tank if lighting withT5s, but on the bottom if using Metal Halides. The Millepora genus is very aggressive. These hydrocorals will encrust and take over other corals, so keep your eye on their growth rate. Make sure you space them at least 6” from other corals. Possibly place them on a rock in the sand away from the main rock work to keep them from encrusting on to the main rock formation. Fire Corals generally grow slowly at a rate of 1/16" to over 3/4" (4 to 20 mm) per year. However when other corals are present they will actually grow faster in their direction, at a whopping 1” or more a month. They are especially fond of gorgonians from the Plexaura genus. They can actually sense a gorgonian, overtake it, and assume its shape. Ironically a strong, swift water current can snap this overgrown structure in half since the gorgonian is now dead and brittle underneath. Hawkfish are often found on these corals, and use them for protection. They can do this because their tissue-less pectoral fins are immune to the sting. The Crown of Thorns Seastar will also not bother this strong stinging coral. Venomous: Yes - Their tentacles can sting flesh badly and will sting other corals. Same species - conspecifics: Sometimes - If they are spaced enough apart. Anemones: Monitor - Anemones wander, so keep an eye on them! Mushroom Anemones - Corallimorphs: Monitor - Safe as long as they are no closer than 6 to 12". Leather Corals: Monitor - As long as they are closer than 6 to 12"
Zoanthids - Button Polyps, Sea Mats: Monitor - Safe as long as they are no closer than 6 to 12". Shrimps, Crabs, Snails: Monitor - Very small shrimp may be eaten. Feather Dusters, Bristle Worms, Flatworms: Monitor - Carnivorous commensal polychaetes will kill these corals. Clams, Scallops, Oysters: Safe - Safe as long as they are no closer than 6 to 12". Nudibranch, Sea Slugs: Monitor - Phyllidia nudibranchs will kill these corals. Stony Corals: May be aggressive - Safe as long as they are no closer than 6 to 12". Soft Corals: May be aggressive - Safe as long as they are no closer than 6 to 12". Fire Corals primarily consist of hydroid colonies. These usually have separate sexes consisting of either male or female members. Thus each colony can produce only one type of gamete, either eggs or sperm. There is not usually both sexes in the same colony. The Millepora genus has been propagated in captivity, yet are not always available. Millepora hydrocorals have two principle forms; the predominant body type is the polyp and the other is bell-shaped or the shape of a thin disk. Their life cycle originates as a sessile polyp, and in this stage it multiplies asexually. Animals in the polyp stage are known as “hydroids”. The polyp stage can then bud, forming a free-swimming, planktonic animal, like the jellyfish. In this stage they are known as “medusa” and can produce eggs or sperm. The gametes of Fire Corals are sexually mature in about 20 -30 days, much sooner than the months it can take for stony corals. In the wild, the Millepora genus is not dependent on lunar cycles and will release free swimming medusae at the same time as other fire corals. Their medusae do not live for very long, only a few hours. Propagation is rather simple for Millepora corals. Breaking and cementing the pieces onto plugs or rock is a typical way to frag this coral. Rubber banding to a plug or rock is another way that has been used. However, there is another way that is quite ingenious. Place rubble rock around the Millepora, and let their encrusting tendency take over and cover the rubble. Then simply break away a piece of rubble as a frag. Ease of Breeding: Easy - To propagate, fragments are cut and glued on to plug or live rock. The Millepora genus, although not susceptible to many things, does have few areas that can lead to its demise. Having zooxanthellae algae makes them susceptible to bleaching. Higher temperatures than they are used to will cause this too, along with their being too close to a Metal Halide lamp. Predators are another nuisance. These include the Pyrgomatina barnacles, both commensal and carnivorous marine worms, (polychaete), and Filefish from the Aluterus and Cantherhines genus. The Crown of Thorns Starfish Acanthaster planci, will also eat these hydrocorals, even thought they are stung in the process. Some of the most interesting predators are nudibranchs, such as the Phyllidia nudibranchs. These feed on Fire corals but can ingest the stinging nematocysts without digesting them. They then use these same nematocysts as defense by transporting them through their intestines to their dorsal appendages. When the sea slug feels threatened, it will then fire the stinging nematocysts at the predator! The Millepora genus is very hard to find at pet shops and on line. These corals can sometimes be sold under “Hydrocorals” or “Fire Corals”. They may possibly be special ordered from a local fish store.